I’m sure there is some sort of Universal Karmic connection between my children’s behavior and the long history of border disputes between France and Germany. Just hear me out. We made another jaunt over the border into France this weekend. (I’ll write more about that soon.) We live less than an hour’s drive from the border…but the border wasn’t always the border. In fact, given the history of the French-German border, I think they should just call it the Sorta-Borda, because (if history is any predictor) it will be shifting again any decade now. It’s like the San Andreas Fault in California—once the pressure builds, it will shift. It’s like my kids that way too…but more on that later. About the “borderlands” of Germany and France: I recall some long-ago history class lecture about the Alsace-Lorraine region of France being passed back and forth between German and French hands over the centuries. The cuisine, town names, and architecture make this blatantly obvious. But I’ve only just learned that this geographic game of “hot potato” has continued into the 1900’s, and included some areas of the Rhineland-Saarland in Germany. 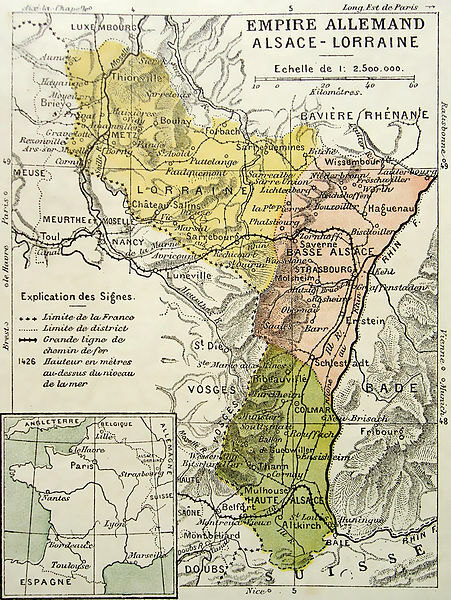 In the 1870’s, the French lost much of the Alsace region—as far in as Metz—to the Germans, and it wasn’t returned again until 1918. On the flip side, my husband tells me that parts of the present-day German Saarland were only “re-Germanated” in the 1950’s. About Snarky Siblings: This historical perspective makes me feel a little better about the “border disputes” that have been going on in our family since we moved into our Scooby Doo castle-house—we seem to be stuck in the “Hassle in the Castle” episode. The kids are constantly arguing about which room is better, who gets which room, who then lays claim to the room that falls between the two rooms, who gets dibs on the top floor of the house, etc. Holy Crum! I think we are heir to two legacies here—the teen/preteen gimmees, and the French/German borderland disputes. That equals “land-grab squared,” and it ain’t pretty. Whatever developmental/hormonal forces are at play with my kids are ramped up by some sort of historical/geographic energy field that is beyond our control. That’s how it seems… and it makes for the better story. Who’s to say that it’s not true? I grew up in the South, and I’m convinced that the power of place is strong. With a little parental intervention, our in-house border disputes seem to be slowly working themselves out. Let’s hope they hold more firm than their European historical precedents.